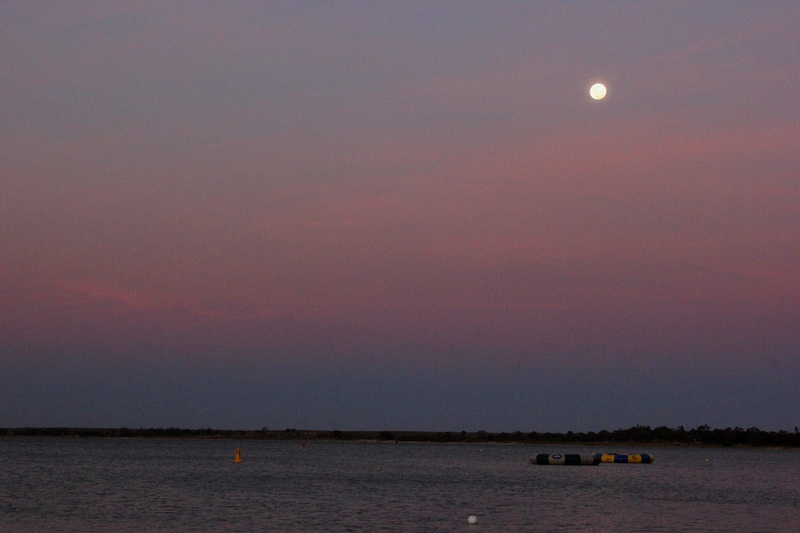 Lake Bonney is an easy drive from Adelaide, taking around 2 – 2.5 hours, leading you to the small town in the Riverland region Barmera, where the very large freshwater lake is situated. 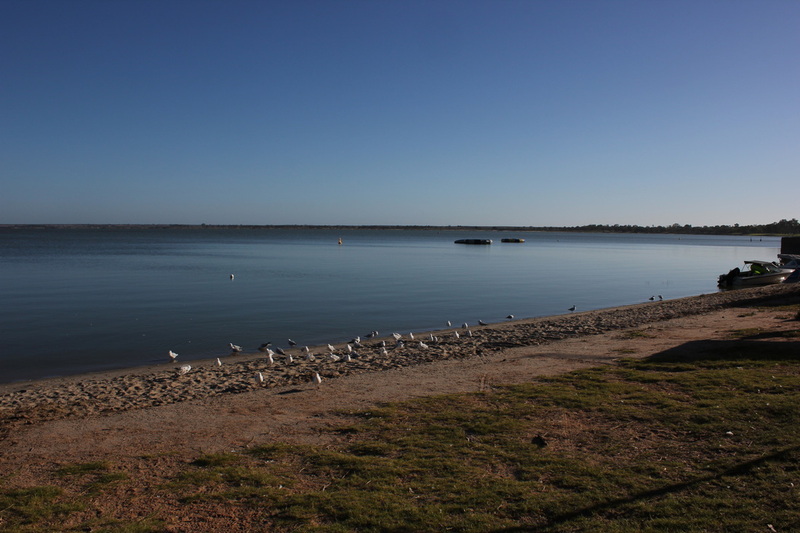 A scenic drive from the small town centre of Barmera (where you can stock up on food and drink supplies), takes you around the lake in an anti-clockwise direction (from Barmera). As you drive along, on the left you will see scrub land and parks with dirt roads leading off the main sealed road. In some of these areas you can camp for free. More established parking areas exist, but they are clearly indicated as No Camping. The free camping areas are right on the shores of the Lake and are not indicated, but its pretty much wherever you wish to set up. Its a very tranquil spot, to sit back and enjoy the Lake or have a swim. Shade varies greatly around the lake, but for the most, there is not a lot. In summer, you should be prepared to have some sort of tarp/shelter to protect you. There are no amenities around the lake – no clean water, nor toilets. Chemical toilets are definitely a must! No toilet? Then this is not the place for you. As you approach Nappers Bridge (and where you can enter Loch Luna Game Reserve very close by), there is an established public toilet in the bush area, but its condition was not looked into by us. I wouldn’t want to count on it, as it looked very basic. Camping here is a very peaceful way to enjoy the beauty of this area, and not be crammed up against other campers. 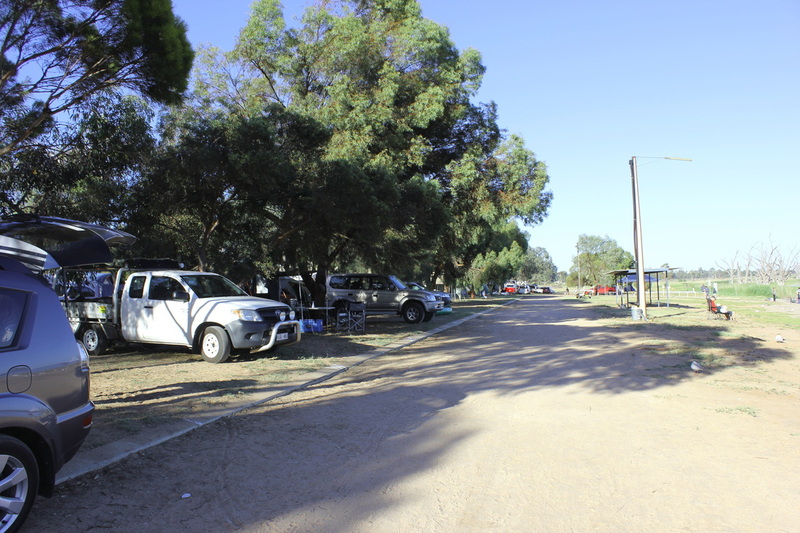 This Park is very close to town and is the main caravan park for this area (there is a smaller, less established one along the Lakeside Scenic Drive). This place has the amenities and attractions that many people are looking for in a park these days – like the swimming pool, jumping pillow and equipment to hire. So if that is the sort of caravan park you frequent, then this place could be your sort of camping locale. We visited in January school holidays; a peak time for these parks as people escape the city, to relax up in the Riverland by the water. It is a very very popular time. Don’t like crowds? Then avoid this park in peak season. Caters for mainly caravans with ample powered sites and unpowered sites. Costs vary depending on where you camp – closer to the Lake, costs a little more per night. There are also some cabins, though we didn’t see inside any of them. Most of the sides have shade, and they all have some grass (though not a lot). There is no privacy at all amongst sites. When we were there, everyone was packed in like sardines in a can. With tents, you have more options for altering your tent to maximise privacy, but the caravans were right up against each other. The unpowered sites backed right onto the powered sites, so you hear everything going on nearby. The man in the caravan behind our tent certainly could snore, and the child in the other caravan had a hacking cough that went on all night. Such was the proximity. View from the beach, looking to the unpowered sites. 2 amenities blocks, which were clean though starting to show their age, particularly the one furthest from the entrance to the park. It really needs some updating. Laundry and TV/Games Room also available, and a swimming pool (not large enough for a park this size, so consequently always crowded). One BBQ area, consisting of 2 BBQs. The sign says they are free to use, yet one needed money (which it ate promptly, without ever turning on the BBQ). The second BBQ – don’t know how many burners were actually working, but it took over 30 mins to cook a couple of sausages. So the moral of this story – bring your own BBQ. Most campers had. A big highlight for the kids is the floating trampoline on the lake. With lifejackets on (provided), you can swim out to the trampoline and jump off it onto the lake. Suitable for all ages, though little ones will need adult supervision getting out to the trampoline, as it is a fair distance if you swim (or you can hire little paddle boats). Also climbing onto the trampoline, younger children may need assistance too. The Lake is great for swimming and water sports. It has a lovely sandy bottom, so not unlike the beach, and there are plenty of people with power boats, jet skis and canoes. Fishing is also popular early morning and evening, though carp seems to be all that anyone was catching. Note: We noticed some people using their jet skis and power boats too fast close to shore (and therefore not complying with personal watercraft safety guidelines) and therefore I would recommend watching out for them when they return to beach, just in case they are not watching you. Water trampolines on Lake Bonney, early am. The sites closest to the lake are unpowered sites, so theoretically you should have uninterrupted views of the lake, apart from the people using the lake. This is not necessarily the case. For those people who have not paid for Lake side, and are further back in the park, many brought large shelters (and we are talking 14 foot shelters x 2 put together), and set them up at the front of the lake, on the beach area. They would keep them up all day/night, or set them up first thing in the morning. The shelters would have tables/chairs/eskies and a lot of people in it. On the day we left, there would have been 5 large shelters already set up by 9am, taking up a large amount of the narrow beach area assigned for the caravan park. This is so they can be by the Lake for the entire day. So those who have paid to be by the Lake, are now gazing out at these shelters (and their 4WDs which they used to bring down the gear). Plus there was the added bonus of them playing their music very loud from their cars or from their power boats – so everyone could hear. Others brought their cars and boat trailers and parked in front of the unpowered sites to add to the beauty (despite there being an area for extra vehicles). I understand the need to be near the water, especially if using water vehicles and supervising children. But, it made large areas of the narrow sandy beach, inaccessible for others. 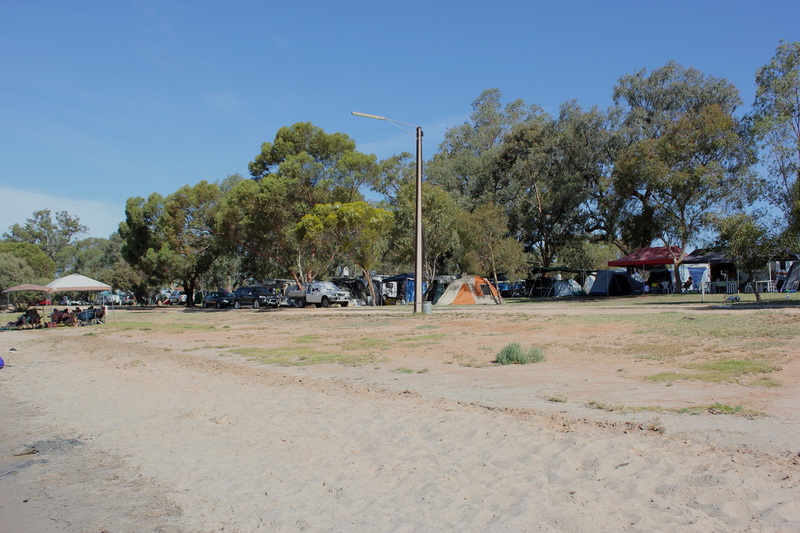 Now when these people who have camped out on the beach for the day, decide to go back to their own site for whatever reason, rather than walk around the road to wherever they were sleeping, most of them cut through campsites – never an ‘excuse me’ or apology. There was an empty site next to us for the first day, yet many still walked through our camp like it was empty! I found this to be the downside of this location, and a reason why I would never visit in peak season again. Mark emailed and advised "We visited this CP in October 2012 and it was fantastic. It was much quieter though as I think we were avoiding the SA school holidays. There was definitely no one setting up shelters. I really like this park and would go back again but i think the quieter months sounds like the time to go"